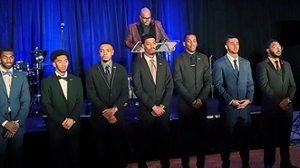 The men of Southern Illinois University Edwardsville Collegiate 100 have boosted its membership, increased its collective GPA, participated in on-going personal, professional and leadership development opportunities, and engaged in more than 250 hours of community service on campus and in Metro East communities. These are just a few reasons why the SIUE Collegiate 100 Chapter received the 100 Black Men of Metropolitan St. Louis Regional Chapter of the Year Award on Saturday, Dec. 8 at the 100 Black Men of Metropolitan St. Louis Annual Fundraiser and Black Tie Gala, according to Darryl Cherry, SIUE Collegiate 100 advisor. SIUE’s Collegiate 100 is an auxiliary organization of the 100 Black Men of Metropolitan St. Louis and serves an important role in assimilating, developing and mentoring African American males on the SIUE campus. Its current membership is 21 students. Criteria for the award was based on sustained membership growth, academic excellence, professional and personal development of members, chapter service hours and the number of people served by the chapter. According to Collegiate 100 Founding President Ricky Rush (2015-16), the SIUE Collegiate 100 Chapter was formed April 20, 2015 in the aftermath of the Michael Brown shooting in Ferguson, Mo., and in a culture that African American scholars wanted to define the black narrative and build a culture of support. Other SIUE Collegiate 100 Chapter founding members are Charles Anderson, Gregory Collins, Reginald Hamilton, Gerald Lewis, Charles Martin III, Jeremy Miller and Kyle Shaw. Royale Jones served as president for 2016-17.